“Results of a new study by UCLA researchers has found that a groundbreaking new triple combination therapy shows promising signs of more effectively controlling advanced melanoma than previous BRAF + MEK inhibitor or BRAF inhibitor + immunotherapy combos alone, and with increased immune response and fewer side effects. “An estimated 70,000 new cases of metastatic melanoma are diagnosed each year in the United States, and of those 8,000 will die of the disease. About 50 percent of these men and women (or 35,000 a year) have a mutated protein called a BRAF mutation, which in most cases allows melanoma to eventually build up a resistance to many drug therapies. “In the new study led by UCLA Jonsson Comprehensive Cancer Center member Dr. Antoni Ribas and colleague Dr. Siwen Hu-Lieskovan, UCLA scientists combined targeted therapies utilizing a BRAF inhibitor (dabrafenib) and MEK inhibitor (trametinib) with immunotherapy. The three together are shown to be more effective treatments by sensitizing the patients’ own immune system to enhance immunotherapy, and reduce the probability of the melanoma eventually developing resistance. 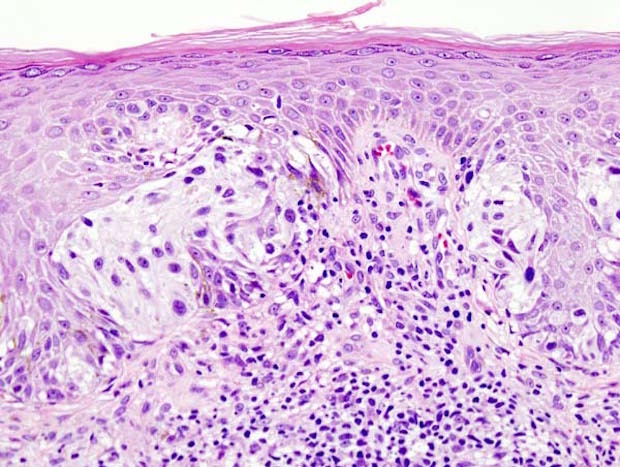 The gist: New research suggests that some melanoma patients might benefit from a treatment schedule that alternates BRAF inhibitor drugs with MEK inhibitor drugs. The scientists hypothesize that this schedule could help prevent drug resistance and metastasis. The researchers set out to figure out why patients who receive BRAF inhibitors develop more metastases than patients on standard chemotherapy. They found that unusually high activity of a protein called EphA2 on cancer cells may be the culprit. Taking away BRAF inhibitors seemed to lower the aggressiveness of these cells. So, periodically taking away BRAF inhibitors from patients might theoretically help stave off resistance and metastasis. “Moffitt Cancer Center researchers have discovered a mechanism that leads to resistance to targeted therapy in melanoma patients and are investigating strategies to counteract it. Targeted biological therapy can reduce toxicity and improve outcomes for many cancer patients, when compared to the adverse effects of standard chemotherapeutic drugs. However, patients often develop resistance to these targeted therapies, resulting in more aggressive cells that can spread to other sites or cause regrowth of primary tumors. “B-Raf is a protein that is frequently mutated in human cancers, leading to increased tumor cell growth, survival and migration. Drugs that target B-Raf or another protein in the same network called MEK have proved effective in clinical trials. Several B-Raf and MEK inhibitors have been approved with the combination of a B-Raf and a MEK inhibitor being the current standard of care for patients with B-Raf mutant melanoma. However over time many patients become resistant to B-Raf and B-Raf/MEK inhibitor therapy. The gist: Researchers tested a new melanoma treatment in a clinical trial—a research study with volunteer patients. The treatment combines the targeted drugs vemurafenib and cobimetinib. All of the patients who participated in the trial had melanoma tumors with mutations in the BRAF gene, as detected by molecular testing. The combination treatment proved more beneficial for these patients than vemurafenib alone. “Combination therapy with both BRAF inhibitor vemurafenib and MEK inhibitor cobimetinib achieves greater progression-free survival and response rates than vemurafenib plus placebo in BRAF-mutation positive melanoma, according to phase III data presented at the ESMO 2014 Congress in Madrid, Spain. “ ‘Before the results of this study, we knew that cobimetinib plus vemurafenib could be safely delivered together with highly promising rates of tumour shrinkage; however until the performance of a scientifically rigorous randomised trial the potential magnitude of this benefit could not be measured,’ says lead author Dr Grant McArthur, head of the Cancer Therapeutics Program at the Peter MacCallum Cancer Centre, Melbourne, Australia. “The ongoing CoBRIM study enrolled 495 treatment-naive patients with BRAFV600-mutation-positive unresectable locally advanced or metastatic melanoma. Patients were randomised to received a 28-day treatment cycle of vemurafenib (960 mg, twice daily), and either cobimetinib or placebo (60 mg daily from days 1-21), with a primary end-point of progression-free survival.